One of the very first things Christina, my physio, got me to do when I recently attend the neuro-physiotherapy department was to do some boxing. Not only does it tone up muscles but it’s great for the cardiovascular system as it gets your heart pumping which helps towards loosing weight. I took to boxing like a duck takes to water. I love it !!!!!!! Scott my personal trainer at the gym has incorporated boxing into my exercise programme so he’s been teaching me different boxing techniques. Santa brought the wii boxing to life as one of my presents was a boxing set comprising of jab pads, a pair of boxing gloves and a three foot punch bag. 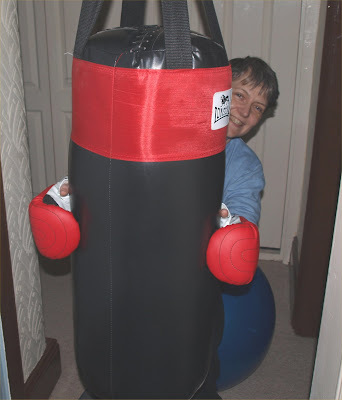 Yesterday John set up ‘Mr Punch’ (my punch bag) so I can start punching the living day lights out of our ‘boxing list’. Whenever I’ve been boxing at either the physio or the gym I was told to think about someone I hate and imagine I’m hitting them. To be included in the ‘boxing list’ hall of fame the person has had to actually done something to cause us grief. For example top of the list is Gordon Brown MP. If it hadn’t been for him making private pensions completely worthless John would have been able to retire from work two years ago. So instead of imagining hitting someone, I’ve printed off photo’s of those in the ‘boxing list’ so they will be put on Mr Punch and I can hit them for real. Time to give Gordon Brown a good thrashing !!!!!!! This is quick and easy supper dish. The crisps give it a lovely crunchy topping. You can of course make it without the crisps if you are counting the calories. Meanwhile grill the bacon then cut into small pieces. Don’t switch the grill off. Add the bacon, herbs and black pepper into the cheese sauce. Drain the cooked pasta and add it to the cheese sauce. Pour the pasta mix into warmed individual ovenproof dishes then top with the crisps. Grill under a medium heat until the crisps are golden brown. Sliced tomatoes: arrange over the top of the pasta and grill until tomatoes are hot. Breadcrumbs: take 1oz of breadcrumbs and sprinkle over the top of the pasta. Grill until golden brown. Further to my last blog guess what turned up on Wednesday – my cards from the former US Presidents…. Then what should arrive in the post on Thursday but yet another set of cards !!!! As this is our last blog before the big day John and myself wish you all a very merry Christmas and a Happy New Year. PS the ‘recipe of the week’ will return on Boxing day (or December 26th for those reading this who are not from the UK). Whenever Morrison’s haven’t had any greeting cards which I like (which is most of the time) I’ve had them specially printed by one of the on-line card companies – you’ll have seen them advertised on TV. Given the cost of cards in places like Morrisons or WHSmiths, the cost of ordering a card from one of these companies is about the same. Plus you can make them personal, which is what I like. Having checked Morrison’s for Christmas cards – as usual nothing – both John and myself ordered cards on Sunday 4th December. John from one company and mine from a company who’s name is a former US President. John’s arrived on Tuesday 6th, but mine didn’t. No worries I thought as it’s the time of year when the post is going to be delayed. After the post had come on Wednesday 7th I gave them a ring. They were sent out yesterday, said the little woman. The good old ‘it was sent out yesterday’... Which really meant ‘we’ve done nothing so better get it sorted today’. I was assured they would be here Thursday or Friday at the latest. Friday’s post came and went and no cards. Time for the Customer from Hell. I always give then one chance to put things right then out she comes. “They were sent out yesterday”, said the little woman. “If it was sent out ‘yesterday’ how come I was told that on Wednesday”, I replied. She thought for a while. “It looks like there’s been a computer problem”. Another saying from the book of excuses…. “I’ll get they re-printed today and you should get them on Monday”. “Are you sure”, I quizzed. “Yes. You will have them on Monday”. Monday’s post came and went and still no cards. The Customer from Hell was beginning to get more than a little annoyed. “They have been dispatched”, snapped the little woman, “however you rang after our next day cut-off time so they will be here tomorrow”. “They better”, I said, “otherwise I will not be happy if I have to ring you again”. Just to make sure I actually had some cards to give I went on to another card site and ordered some more cards. If the former US President’s came then I’d put one lot away for next year. Tuesday’s post came and you guessed it, no cards. I decided to give them one more day just on the very slim chance that they had been delayed by the Christmas post. Wednesday’s post came and went. Yep, no cards. “‘Former US President. Can I help”, said the little woman. “Can I speak to your manager please as I have a lot of shouting to do and you’re not paid enough to be shouted at”. I explained what had happened and told her in no uncertain terms that I was not a happy bunny. “I can understand why you are not happy Madam”, she said, “however the cards were sent out ‘yesterday’”. “Yesterday”, I repeated, “I’ve had enough. I want a refund”. “Certainly Madam. I will arrange that now for you”, she said quickly, which makes me suspect that I wasn’t the first to complain, “on Thursday you’ll also receive your cards, which you can have free of charge from us”. Thursday came and went, so did Friday, Saturday, Monday and today. Still no cards…. Whilst all this is both amusing and annoying, what would have happened if I had asked for cards to be sent straight to the recipients. I would have had no way of knowing they had not being delivered. A wonderful, light, yet simple cake that is so delicious. Here’s where the twist is. Instead of the usual two egg, 4oz mix of flour, butter and sugar that is traditional for a sandwich cake, this recipe is slightly different. The eggs, still in their shells, are weighed and whatever it says on the scales, you weigh out that amount of flour, butter and sugar. For example, the two eggs – still in their shells – weigh 4 and ¾ oz’s. Measure out 4 and ¾ oz’s of self-raising flour, caster sugar and butter/margarine. No matter what the eggs weigh, always use the same weight for the flour, sugar and butter. Weigh the eggs, still in their shells. Whatever the eggs weigh, that’s the amount you’ll need for the flour, sugar and butter/margarine. Put the sugar and butter/margarine into a bowl. Sift the flour along with the baking power into a bowl, then add the two eggs. Beat well until everything is combined and mixture is smooth, to the point that it will drop off your spoon. Bake for 20 – 25 minutes. Try not to open the oven door during the cooking as this can stop the cakes from rising. If you think that they make be browning too much, only open the door when you are past half way in the cooking time. To check to see if the cakes are cook, gently press the surface of the cake with a finger. If it springs back it’s cooked. You can also test it by using a skewer (or knitting needle or a piece of spaghetti). Piece the centre of the cake. If it come out clean then it’s done. Once the cakes are cool, spread the jam over one of the cakes. You can use as much or as little as you like. Try not to get the jam too close to the edge as it will spread naturally to the edge when the other one is put on top of it. Take the other cake and carefully put it on top off the jam layer. Finally sift the icing sugar over the top of the cake. This cake can easily be made bigger. If you wish to use three eggs then simply weigh them as before. Apologies for being a bit late putting up the recipe of the week, only we spent the weekend putting up the Christmas decorations. Anyway, here’s a lovely crumbly cake which is delicious eaten when warm. It makes a great alternative the traditional Christmas cake. Line a 7 inch/18cm round cake tin with baking parchment. Sift the flour and mix spice together into a bowl. Rub in the margarine or butter. Add the sugar, raisins, sultanas, mix peel and cherries to the bowl. Next add the beaten egg and enough of the milk so that the mixture drops from a wooden spoon when shaken. Pour into the tin and bake in the oven for 1 hour, or until a skewer comes out clean. Leave it in the tin for five minutes before turning out onto a wire rack to cool. No complicated measuring required to make this. All you need is a cup or a mug. Just make sure you use the same one throughout. Line a 1lb loaf tin with baking parchment or non-stick liner (Lakeland sell them and they’re brilliant). Start the day before you intend to make the loaf. Put all the ingredients except the flour into a bowl and mix well. Cover with a tea-towel and leave overnight. Stir in the flour, making sure you scrape the sides of the bowls thoroughly, and pour the batter into the loaf tin. Please soak the bowl as soon as you’ve finished with it as the mix sets like concrete if left !!! !